It’s always crucial to read up on the related issues once you’re just getting into paintball sport on the battlefield. It has common basics to learn before you go like how to play the game, what types of equipment will you need or where to go for playing the sport etc. Once you start playing the sport your learning curve will be proportionately fast as well. But, the reality is that the advanced players often need to scour the internet for further information. It’s vital to know about the tactical strategies, paintball equipment maintenance or even different game variations to be an effective player. The beginners must be careful about two basic things when they decide to start practice – safety measures and a reliable gun. Spyder MR100 Pro Paintball Gun Marker Mega Set is a great option both for the beginners and intermediate level players. The gun helps you get in the middle on the battlefield. It is accurate in firing and lightweight, perfect for all. It is made of durable materials and the structure is solid. Moreover, the marker comes along with all the safety measure kits, so you can easily avoid unwanted injuries. It has an affordable price and you need not to worry about spending a lot of money for starting the sport. Analyzing the customer reviews of the product you can come to a decision that it’s a great option both for beginners and advanced players. It’s easy to use and full of fun. It’s made of high quality materials and has excellent rating, 4.2 out of 5, based on 20 customer reviews. Analyzing the rating and what people have to say about Spyder MR100 Pro Paintball Gun Marker (Mega Set), here are the main pros and cons of choosing of choosing the gun. The gun is a fun and easy to use. The paintable marker gun shoots straight and accurate but sometime it may seem a little slow. The Kingman Group established its reputation from the beginning in 1992 with the Hammer™ series pump action marker. But, the group completely changed the scenarios and scopes of the sport with the legendary Spyder® semi-automatic series. The company is really dedicated to promoting the paintball sport and very well known for its affordable as well as reliable paintball markers. The Kingman Group works with highly skilled engineers and professionals to upgrade the quality and bring innovative features of paintball markers. 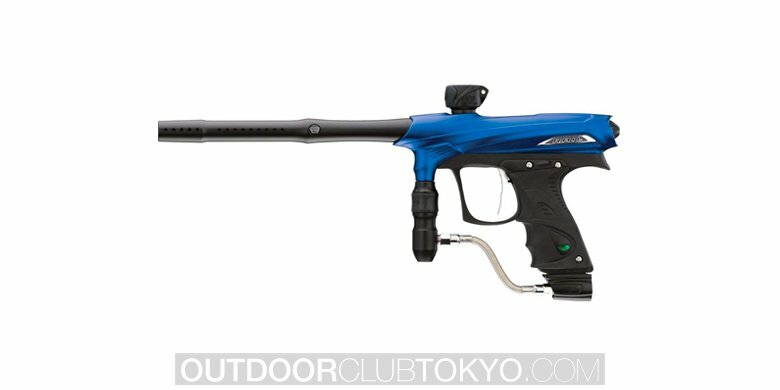 Spyder MR100 Pro .68 Caliber Paintball Gun is made of incredibly high quality materials. It is lightweight, reliable, and accurate as well as has a solid design. The compact internal design and aluminum gun come up with some other exclusive features. The mask has anti fog lens and visor treated for superior aiming. It is perfect for both the children and adults as the gun has a wide field view. The gun works with .68 calibers. It has an Eko Valve system (air efficient) that simply shoots from a CO2 tank (20 oz) up to 1,600 shots. It has the high impact feed neck (polymer clamping) and for mounting accessories; a rail mounting system (pica-tinny – multiple sides). You can transport the paintball marker with ease as it has car shoulder strap (adjustable). The package includes Mask (GXG XVSN) with Anti Fog Lens and Visor. It has Paintball Harness (Deluxe – 3Skull 6+1) and Heavy Duty Ultimate Paintball (6 – 140 Rounds). Moreover, it comes with Jerk Squeegee (Orange – 3Skull 21″) and 1oz Gold Cup Oil to make it really exclusive. Overall, Spyder MR100 Pro .68 Caliber Paintball Gun is a great option for all the paintball enthusiasts. All the materials are made of high-quality materials and it will definitely stand you out among the opposites on the battlefield. The marker is accurate and lightweight so you can use with ease. Most importantly, you can upgrade the usability whenever you feel the need. Enjoy!